By the way, this tank was awesome! And here I go again! I’ve started yet another healer, this time a mistweaver monk. I’m leveling this one to be the healer in several Herald of the Titans runs. 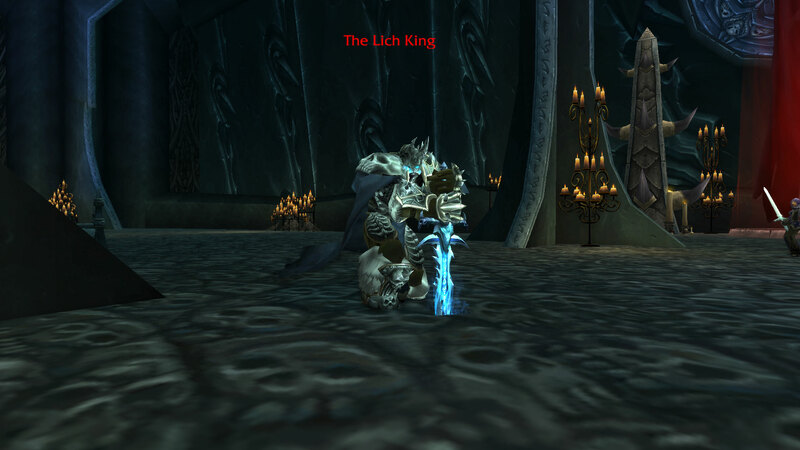 Which in hind sight, might not have been the best idea considering that monks were not around when Wrath was current and there is no tier gear for them. Oops. I’m too far along though to turn back (BC leveled at the moment of writing). I chose mistweaver for two main reasons. I have never played a monk beyond level 20 and I was curious about fistweaving. Monks beyond level 20 is a truly enjoyable affair, but fistweaving not so much. First, let’s start with the positives. I’m really enjoying monks! I think the Chi system worked out remarkable well and feels intuitive (instead of tacked on like it is for paladins). There’s a good rhythm of building and spending chi, especially for mistweaving. And the accelerated leveling is a gift that keeps on giving. Monks feel fast, light on their toes, and flexible. If I had to pick one negative thing, I would chose the fact that one must constantly interrupt the channel of soothing mists. For years I have been trained to never interrupt channeled casts until they are done. Especially for healing abilities (Tranquility and Divine Hymn come to mind), you never want to interrupt if you can help it. And this ingrained knowledge has made it difficult for me to interrupt Soothing Mists to cast other abilities. It’s a small pet peeve, but I feel guilty every time I end Soothing Mists early. While I think Mistweaving is enjoyable and lively, the same cannot be said for fistweaving. I feel that fistweaving could be fun and enjoyable, but right now it is weak. Very weak. Perhaps this gets better with level or gear, but as it stands I cannot reliably heal by fistweaving. I know I’ve already mourned the loss of dps healing, but it still haunts me. There is just something innately appealing about being able to do two roles at once. While I don’t advocate for the return of SoO disc levels of power (while enjoyable, it was a balancing nightmare), I do think that dps healing should have some sort of relevance. It’s just too entertaining a mechanic to get nerfed into oblivion. Other than fistweaving, monk has been an enjoyable healing class! Monks are different enough that the play style doesn’t feel like any other class, an impressive feat considering all the different healing builds out there. And as a bonus, when I get to max level, there are a bunch of monk transmogs just waiting for me to wear them! He’s sort of horror story-ish, right? And now for something completely different, Fussypants writes a horror story! Has I gone mad? No there’s a reason behind this! I just got home from vacation and all of my time has been devoted to catching up on schoolwork. In my English class, this meant I had to write a horror story (which was due today). So I figured, instead of squeezing in a WoW article between all my schoolwork, that I would just post the story I already wrote for you all. No, its not WoW themed (that’s the really horrific part 😛 ), but I still think it’s kinda cool in a creepy, horror story sort of way. So without further adieu, Fussypants presents…. They always told you that adulthood would be a fantastic thing. You would be free and independent, allowed to choose your own destiny. The world would be your oyster, and all you had to do was go out and pursue it. What they didn’t tell you about was the monotony. The mind numbingly dull repetition. You were one of the lucky ones who got a job. But stability granted you no relief from the endless drone of life. It wore on you, as endless as the ocean. Every day was the same. He woke up, the alarm with its shrill insistent beeping. The shower was always cold and his shirts never as white as he hoped. Breakfast was the same cheap coffee every day. He caught the bus at 7th and Haviture, two blocks from his apartment. Fifteen minutes later, and he arrived at his job and his entire life. The office building was a lifeless tan and unimaginative in design. It was as if the builders had all sat down and came up with as many boring and cliché elements to include before constructing. He didn’t look up, but he knew what was branded above the grimy doors. Pierson Law Firm. Even the name was bland. Joined by the numbed masses, he trudged across the lobby and into the elevators. They slowly climbed, like old mules under the weight of all those people. At every floor, a tired ding announced their arrival. He got off at the 31st ding. Every day was the same, and today was no different. He shuffled down the hallway of cubicles like a prisoner to execution. With a final sigh of surrender, the man lowered himself into his desk chair. The computer was switched on and slowly began to load. The Windows logo blazed across the screen, and he got down to work. Several hours later, and he could no longer sit. His knees burned with disuse and his eyes ached. With a groan, the man stood up, and wandered over to the water cooler. Now the water cooler was more than a simple place for refreshment. It was the heart and soul of the office. All gossip started here and all news came through it first. There were always two or three ‘condors’ there. A condor was someone who monitored all that happened at the cooler. No one could hang there without first earning the approval of a condor. And somehow, the condors never got in trouble for avoiding work. They were, despite their name, the top of the food chain in the office. He meekly tiptoed over to the cooler. Today, the condors were two women from the larger cubicles and a man known as The Pen. All three were relatively powerful condors, but they were too immersed in their own conversation to notice the arrival of one lean, pale man in an ill-fitting work suit. “I don’t want to spread any rumors,” The woman lowered her voice, “but I personally think there will be cuts in the human resource department, also the tax, real estate….” The woman’s voice dropped even softer, and he could no longer hear her. The cup rested, empty, in the man’s numb hands. His collared shirt suddenly felt like the tightest thing in the world, and he choked on the air. Before the condors could notice, he ducked away, back into the relative safety of his cubicle. Eyes wide with terror, he gazed unseeing at the walls of his cubicle. The company calendar hung next to the company’s mission statement. Our goal is to provide our clients with the highest quality legal services. We will not rest until every client has received the premier and professional service that they deserve. Will not rest… not rest…. Panic frizzing in the back of his mind, he committed himself even more to his work. The hours melted by, narrated by frantic typing. Endless lists of numbers blurred into one strip of glowing white. His nails clacked on the keys while his fingers jumped on the mouse. The end of the day bell broke him out of his trance. From all around came the animated shuffling of dozens of people packing up and heading out. He stared at the screen, unable to comprehend the gibberish scrawled upon it. Then with sinking finality, he hit the grey submit box and packed up to head home. The old mules carried him and all his coworkers down to the lobby. The man stared unseeing at the dull reflective walls. Unconsciously, he scratched at his cheek, rubbed his eyes, and played with his finger. The metal prison broke open and the people were released into the lobby. Like a zombie, the man stumbled out of the monotone building onto the waiting bus. His apartment was dark. The man stood, staring into the darkness as reality poured into his soul. He might lose his job. The tiny shred of sanity onto which he clung. The life line which just barely kept him out of poverty. The stability that allowed him to wake up every morning. The man shook, and stepped into his apartment. The fuzzy lights turned on, revealing a pile of envelopes that had been stuffed under the door. He reached down and snatched the pile. Junk. Junk. Catalog. Bill. Junk. Bill. Bill. Bill. He discarded the junk mail, and stared wide-eyed at the bills. As if staring at them could change the numbers inside. As if he could pay off his dues. With shaking fingers, he opened the bills. And stared. Those zeroes couldn’t be right. There must be some mistake. There was no way he could pay that much, even if he had twice the time to collect his money. He slammed the papers down on the table, and shut the door with a tremendous crash. Flinging off his coat, the man stormed into his kitchen. He ripped open the refrigerator, but found it pathetically empty. A scowl on his lips, and he turned to the cabinet. He snatched out the last Ramen noodles, partially crushing the plastic bowl. The kettle was filled, and he stared at the flames. He tried to compare them to his anger, but they were much too small and tame. His rage felt bigger, more consuming like a wild fire. He stamped over to the couch, falling onto it with a grunt. The TV buzzed on, and its pale flickering filled the darkened room. News, something about a shooting. The man stared beyond the screen, completely ignoring the tearful testament of a mother. The story switched, and the announcer began to trill about the economy. Down, loss, spiral into depression. A business owner was interviewed, talking about how hard it was to operate, and how he’d have to lay off some workers if things didn’t improve. The veins stood out on the man’s forehead as he willed the business owner’s head to explode. The kettle whistled its piercing scream, snapping the man out of his reverie. He rose slowly, and shuffled over. As the boiling water spilled onto dry noodles, the man felt his rage seep away as well. What was the point of being angry? What would that do for him? The man returned to his couch, meal clutched in hand. He flipped the channels to one of those humorless comedies, and scratched his cheek again. Then, he began to eat. Long after he was done, the man continued to stare at the television, willing his troubles to melt away like those in the shows. Always the same for them, half an hour later and all their problems were solved. Why did they get it so damned easy? What makes them special? A dark cloud descended and wrapped around the man, but still he blindly watched the blinking screen. The man woke with a start. The TV still flickered, though the rays of dawn now cracked faintly through the shabby curtains. He jumped up with a start, and stared down at himself. Ramen was stained on his not quite white shirt. His pants were wrinkled and covered with cold noodles. And, scratching his cheek, he felt the stubble on his face. Another day, another dollar. The shower was cold like it always was. His shirt was not as white as he would like, and the coffee was cheap and flavorless. But today was not the same. Several pimples had broken out on his cheek. A cloud of doom hung over him, and a sense of finality poisoned everything. The bus was a little late, so he arrived at the building after he usually would. The mules only carried a few stragglers, and seemed to move much slower, as if they were tired already from today’s work. The 31st ding, and the man sprinted to his cubicle. There was a note on the computer. You must fill the quota by today, or a meeting will need to be scheduled to discuss your work ethics. Thanks! ~Management. The man stared at the note like a loaded gun pointed at his face. Then, panic fluttering in his stomach, he sat down and began to type frantically. It was a sea of numbers, and he barely could stay afloat. The numbers ate at him from the inside out and outside in. Forms upon forms splattered across the screen, all carrying one message. Doomed! You are doomed! Doggedly, the man typed on, all while sinking beneath the waves. Too soon, the end bell rang. And still, dozens of forms needed to be filled. Thousands of numbers were unchecked. The quota was not filled. Not even remotely. Empty. He was empty. A void, devoid of all sense of feeling. Like a man drowning in a pool, he could only stare at the quota. The unfilled quota. The quota that would lose him his job. For how long he sat, time cannot tell. But eventually, the dogged sweeping of the janitor brought him out of his trance. Fingers numb, he submitted the form and wandered out of the office. The elevators carried him down, sinking into the lobby. His feet brought him out, out to the dark street. It had rained sometime in the day, and now the night was heavy with the wet orange haze. The sidewalks glistened orange. The air hummed with darkness. The sky, black and inky, glowed with the unearthly orange. The bus had long since departed, so the man shuffled into the dim night. Humidity stuck to his clothing, and the gloom sunk in his mind. His cheek had really begun to itch, so he scratched absentmindedly. The orange buzz of the streetlights against the dark sky put him in a contemplative mood. With remorse, he questioned all that he did, and all that he stood for. The apartment was dark. The man stumbled in, scattering the envelopes all across the floor. He did not notice, as he lurched about. Drunkenly, he lurched about before wobbling into the dank bathroom. He turned the lights on, and stared at his wide eyed, pale face. His pupils were the size of coins. His left cheek was a swollen mass of red irritated splotches. His hair was disheveled and thinning. His shirt had been miss-buttoned, and was off kilter. And skin was pale as a skull. With trembling hands, the man opened up his medicine cabinet. He already knew which bottle to grab, and how many pills. He had calculated long ago. A dozen pills rested in his hand. Their pearly white surface promised oblivion. And their promise was true. But there would be no going back. For hours, the man stared at the pearls. While they might seem white, they were truly black as death. But they were true. The man did not move. To the darkness of the cabinet. He felt a hundred years old. Aching bones and soul, he changed into his pajamas. He settled down on his hard bed under his thin sheets and stared at the ceiling. He signed, turned over, and went to sleep. The alarm shrieked, dancing all around. With purpose, the man rose. His shower was cold, his shirts never white enough, his coffee cheap. But today was not like other days. An air of purpose crisped the air. It was do or die time. While in the bathroom, the man glanced in the mirror. He still looked pale, that was true, but there was a revival of life in his ashen cheeks. And speaking of cheeks, his left cheek had swollen to the size of a plum. It was turning a worrying black, and itched like a band aid on for too long. The man briefly flirted with the idea of going to see a doctor. But there wasn’t time, and certainly wasn’t money. The bus dropped him off, and he marched with purpose into the bland building. The mules seemed energetic today, and the dings lively. At the 31st, he hopped off, and strode into his cubicle. There was a note on the computer. Meeting in Conference Room B at 11. Attendance is required. ~Management. He rolled up his sleeves. It was do or die time. With determination, he sat down and faced the numbers. The numbers streamed down endlessly, but he was ready today. Eyes focused, he battled the forms with vigor. And in the back of his mind, he devised his plan. All the while, the hours slipped by. 11 ‘o’ clock struck, and way too soon. He wrapped up his work, and marched confidently to the conference room. A severe faced lady sat in the big chair, and his morale slipped a bit. But with bitter determination, he stepped in the room and sat down. “Mr. Oliver is it?” It was not, “Please take a seat.” He was already sitting. He sat there, drowning in the news. The woman offered no life preserver, no support, no comfort at all. At last, he was able to mutter something. “I don’t get a chance to defend myself? I’m just… gone?” His voice cracked. “I’m afraid so. The higher ups made this decision, not me,” The woman’s voice held no sympathy. “Good day Mr. Oliver,” With a curt nod, she stood up and strode out of the room. He looked in shock at the large chair she had just been sitting in. Fired… fired…. The man stood up in a trance. Unknowingly, he shuffled to his office, and slowly began to pack his things. There wasn’t much. Little stuff in his cubicle and no fire in his heart. He was cold and empty. Supplies in hand, the man wandered by the water cooler to the last time. The whispers of the condors followed him out to the elevator. The elevator carried him slowly down, a lonely ride to the end. Dazed, the man wandered out of the elevator, out of the building, and into the streets. Somehow, his numb body got him home. Before he knew what had happened, he was at the door of his apartment. The apartment was dark, and the slits of light from the outside did nothing to penetrate the doom. The man wandered to his bathroom, peering brokenly into his reflection. The man’s cheek was bothering him, but he ignored it in his broken stupor. “They ate you alive, and left the bones to turn to dust. His cheek began hurting more, a pinching and wriggling mass. His cheek was a mass of motion. The man was drawn out of his stupor by the sudden pain. He glared at his face, and his eyes opened with horror. The skin under his cheek was moving, lumps squirming around the bulge of skin. The pain was unbearable. His fingers touched the blackened skin. The pain and motion suddenly froze, and all was still. And then his skin exploded open. Thousands of tiny, somethings poured out, onto his face, onto his hand. The man screamed, and stumbled backwards. He stared in horror at the black specs skittering all about. The man screamed again, and the spiders began to pour into his mouth, his nose, his eyes, his ears. He could feel their hairy bodies scraping the insides of his throat and ears and nose. They overwhelmed him, and he fell to the ground. The spiders dug deeper into his body. All he could see were the spindly, hairy legs of thousands of spiders, all he could feel were their legs as they crawled into him. He tried to scream, tried to close his mouth, but there were too many, too many! And then they began to eat. They ate at him, deep in his chest and his head. The man could feel as millions of tiny fangs as they dug into his flesh, tore at his body. The pain was incredible and they crawled down his throat by the millions. They ate at him! They at him from the inside! He could not scream, could not fight, could not do anything but writhe on the ground as they crawled down his orifices. The skittering, thick, moving mass! Darkness and pain! Pain and darkness! The spiders ate him alive, until there was nothing left but bones. And it’s a little tough to admit. I’m playing WoW and it’s all about my garrison. As you might remember, Fussypants and I wrote an article about garrisons wherein we discussed our thoughts and plans. I had written that it would be too much work, that Yotaan did not get very far in the farm, that it would be better if it all was account bound, and the mini-game aspect would not be engaging. I made a foolish Clash of the Clans comparison. Cause of course, now, the garrison is the main reason I play any of my toons. I will log in and immediately check on those follower missions. Fat loot! Then Yotaan dashes over to the salvage yard (okay, some comments here – the salvage yard is the best thing since sliced bread but why is it so far away in Alliance garrisons? My hordie rogue does not nearly need to travel as far – Horde Bias?) and discovers more fat loot in those great crates. Yay!!! Time to level up the followers and boost their ilevels! All leading to the next step, more missions. I have no idea why I enjoy the followers so much but that alone has kept me playing my max toons and even my ones in the lower 90’s. Perhaps there is just enough reward to entice further play. Certainly there is the feel of progression with leveling, and I think that feeling is multiplied with more followers – look, all 3 went up, at the same time! Not all is perfect in garrison-land though. Sadly, professions are profoundly uninteresting and seem to be mostly useless. This is the first time that Yotaan’s leatherworking has barely advanced at all. I had thought that getting the Barn, initially as a way to obtain savage blood, would be fun. Trapping wildlife seems cool, but the actual process is a little tedious and very much a time sink. The leather production from the Barn is too slow as well. The leatherworking garrison options are just not enticing. And yet, I am enjoying the stables, which I surprising. Catching new mounts is surprising fun. Yotaan is the collector of mounts of our cadre of alts, so that is biasing me a bunch. Plus, seeing a fat pandaren on the little talbuk is always funny. Yotaan has become a bloodthirsty gladiator as well. I have leveled up the gladiator’s sanctum and have ran Ashran with Fussypants. If you join a group in Ashran and fight on the main road, then you become loaded in broken bones. Those bones are the currency for your sanctum for more, you guessed it, Fat Loot! Most of Yotaan’s pvp gear has come from there rather than vendors and you can see him in his finest in the picture. 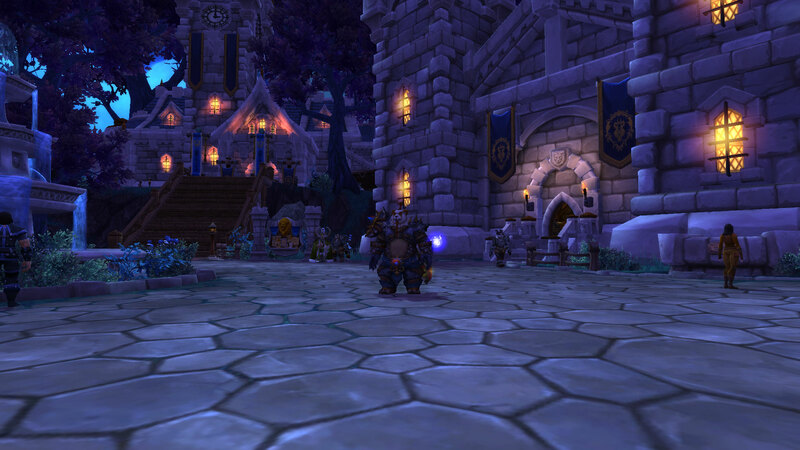 So, shockingly, the feature I had the least amount of interest in, the garrison, has become my focus of play. I hope there will be added features in upcoming patches, cause it really is all about my base. This post was entirely written by Yotaan. I’ve been having a ball in WoW recently. No, I haven’t been raiding. Or PvPing. Or even on my main characters that much. No, I’ve been in the WoWInsider Blizzard Watch guild ‘of The Queue’. I rolled a draenei mage named Fussypants (surprise surprise) shortly after hearing about the guild. I had created a character more just to have one in there, pop in occasionally, and stay connected to the Queuevians. What I didn’t expect was for me to log onto that character everyday. 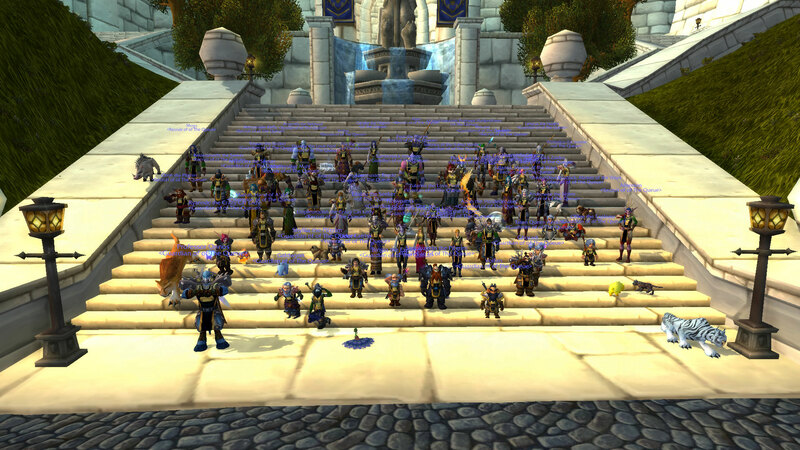 When I joined there were about 20-30 members; not huge but considering the guild was a day old, not too shabby either. But over the next couple days, the guild grew explosively. I think right now we are at about 270 some members. And very few of those are alts. So with about 200 active members, you can just imagine what chat is like. Yup, solid wall of green. Often times there are two if not three different conversations going on at once. People are chatting, joking, and laughing at all hours a day! For someone who has never been in a huge guild before, this is a pretty cool thing! At first I was logging on just to level, read the chat, and occasionally contribute. I sent out a lot of green linen shirts as a joke, but other than that I didn’t do too much with the guild. I was content to be a lurker. But everything changed when I proposed an idea. As a goodbye to WoWInsider, I set up and organized a guild screenshot to submit to Around Azeroth (and yes, it got chosen!) All the members of the guild met up at the steps of Stormwind Keep in their best guild tabard and outfits, and we took bunch of screenshots. It was a ton of fun and a huge success! Shortly after this, I was offered, and accepted, a promotion to officer. Now I’ve been spending most of my time sitting by the Stormwind fountain, chatting in /g, whispering various people, and setting up guild events. I never knew how much fun it was to be a contributing factor in a huge guild. People want to do things together and are always full of ideas! I’m really enjoying just talking with so many people at one time. I rarely ever level now; I just stand in one spot! I won’t say that I was burning out on WoW, but I was definitely less motivated to log in. I was slowly leveling up my toons, but not really for any reason, more just to have them all at 100. Even PvP, my newly discovered hobby couldn’t keep me occupied for long. I guess what I needed was a huge change up. And the Blizzard Watch guild was just that. So this is what I’ve been doing with most of my WoW time. Socializing. Heh, never thought I’d say that! I’m happy that this guild is working out thus far as its a really fun place to hang out! I love my main’s guild too; its great to be in two different guild both full of great people! Come join us! ‘Of The Queue’ is always recruiting any readers, lurkers, or commenters from WoWInsider Blizzard Watch! We are located alliance side on Nesingwary/Vek’nilash/Nazgrel US realms. 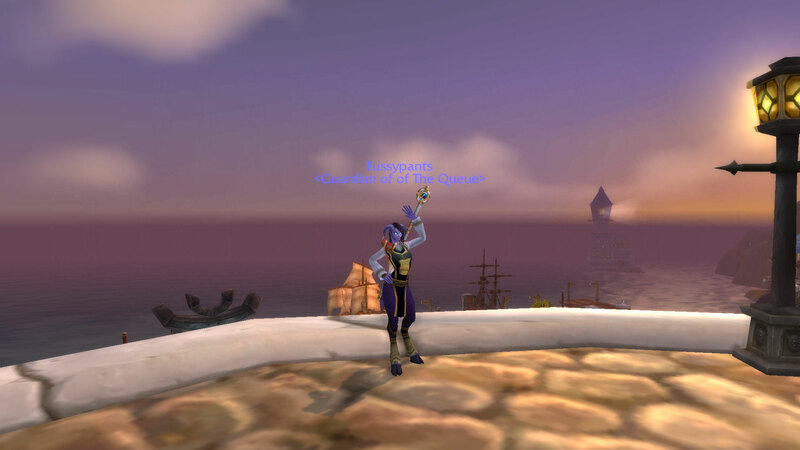 If you need an invite just make your way to the Stormwind fountain and, odds are, you will find me or some other member there! Oh and yeah, we have a pretty spiffy forum page too!